Glass Fusing is different from any other craft because Glass is like no other material. It’s translucency, depth of colour and reaction to light give you a chance to create a unique piece of art work. After a short introductory talk an explanation about working with glass, it’s compatibility and how to cut it properly will be given. Project methods and firing schedules are also explained before each activity. 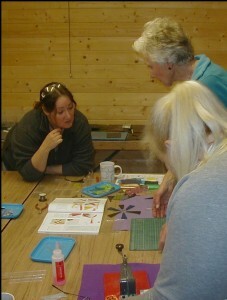 During the course you will then be able to create your own bespoke designs in glass. Items that you may make include pendants, earrings, tea light holders, sun catchers and coasters. Workshop sessions are kept to small groups in order to provide adequate tuition per person. The sessions run from 10am to 4pm. At the end of the day your works of art will be taken away for firing. They will be ready within 1 to 2 weeks depending on quantity and also size of pieces produced. The cost for the day including tuition and refreshments is £110.